Just so you know — you can be a grown up and still play with coloring books. I never grew out of it, myself. I may prefer pencils and pastels to Crayolas, now, but the process is as meditative and creative as it was when I was a little girl plucking crayon nubs from a Tupperware bowl. I remember lying on my bedroom floor at fourteen, fifteen, listening to music and filling in scenes from Disney’s Beauty and the Beast. Fairy tales were always my favorites, with pretty girls and prettier gentleman, frolicking creatures and castle spires. I loved the flowers and the love-knots, the intricate patterns of space and lines just calling out for color, calling me away to a place of imagination and fantasy. I don’t get to do that much anymore – as a mom, things like “free time” and “peace and quiet” are pretty much mythological. But I can say that I love kids’ menus and the obligatory 3-pack of crayons as much as (if not more than) my seven-year-old when we go out to eat. I have been known to zone out over his Sesame Street activity book long after he’s left the table. So when Rebecca asked for a volunteer to review A Coloring Book of Greek Goddesses, my proverbial hand shot right up. 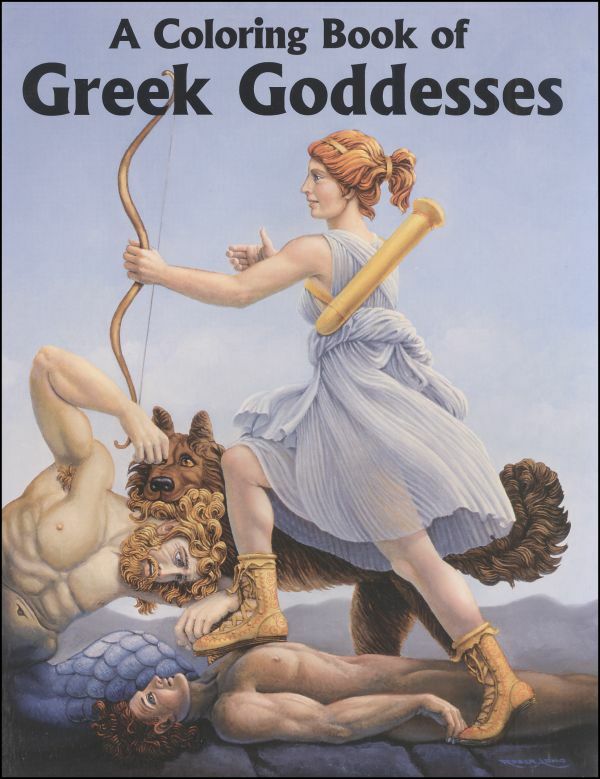 Part of an educational series from Bellerophon Books, Greek Goddesses celebrates the women of Greek mythology. With text written by Bill and Melissa Morison, it introduces dozens of intriguing characters, from Eos, the Goddess of Dawn, to Nyx, Goddess of Night, and, in between, a full cast of gods, demi-gods, and even noteworthy mortals. While I would not say this book is appropriate for young children, like mine (I think the writing would be over their heads, and the detail of the illustrations wasted), it is ideal for mid-grade or young adult readers who are interested in learning more about Classical mythology… or for adults, like me, who are just looking to escape into the beauty of it for a while. The collection features over forty images from antiquity, such as reliefs from the Pergamon Altar of Zeus and the National Museum of Rome. Each picture is referenced – if you are interested, you can view photos of the original artwork online and admire the detail with which illustrator Nancy Conkle has reproduced them. In some cases, the artist has had to recreate details lost or damaged, such as the missing faces of the goddesses in The Struggle of Athena and Alcyoneus. Conkle’s renditions are appropriate to the style and context of the original works, but also manage to impart a sense of personality that I think adds to the fun. This is a coloring book, after all. Each page offers a beautiful picture with clean lines and enticing detail. I could spend hours exploring it with a pack of colored pencils and Pandora on my laptop – if only I had such luxury.